When the King of Barodia receives a pair of seven-league boots as a birthday present, his habit of flying over the King of Euralia's castle during breakfast provokes a series of incidents which escalate into war. While the King of Euralia is away, his daughter Hyacinth tries to rule in his stead and counter the machiavellian ambitions of the king's favourite, the Countess Belvane. Written in 1917, Milne's own introduction begins 'This is an odd book', and indeed it is very difficult to classify. 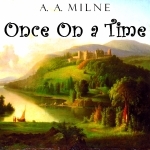 Ostensibly a typical fairytale, it tells the story of the war between the kingdoms of Euralia and Barodia and the political shenanigans which take place in Euralia in the king's absence, all supposedly rewritten by Milne from the writings of the fictional historian "Roger Scurvilegs". Milne created the story to contain believable, three-dimensional characters, rather than the stereotypes which will satisfy children. Hence the book introduces us to a princess who is far from helpless; a prince who, whilst handsome, is also pompous and vain; an enchantment which is almost entirely humorous; a villain who is not entirely villainous and receives no real comeuppance; a good king who isn't always good; an evil king who isn't always evil, and so on. The result is a book which children may not enjoy as much as adults. The book was written by Milne partly for his wife, upon whom the character of the Countess Belvane was partially based. Amazing. Simply amazing. I loved every minute of this book. It's a lovely, complicated, magical story. It's great for kids and adults. The narrator was PERFECT he sounds EXTREMELY professional.